The picture above is the gift the girls gave to their Dada for Father’s Day. They are stepping stones for our next house to place in the garden. Bryan loves all things landscaping, so I thought this would be a perfect hand made craft. 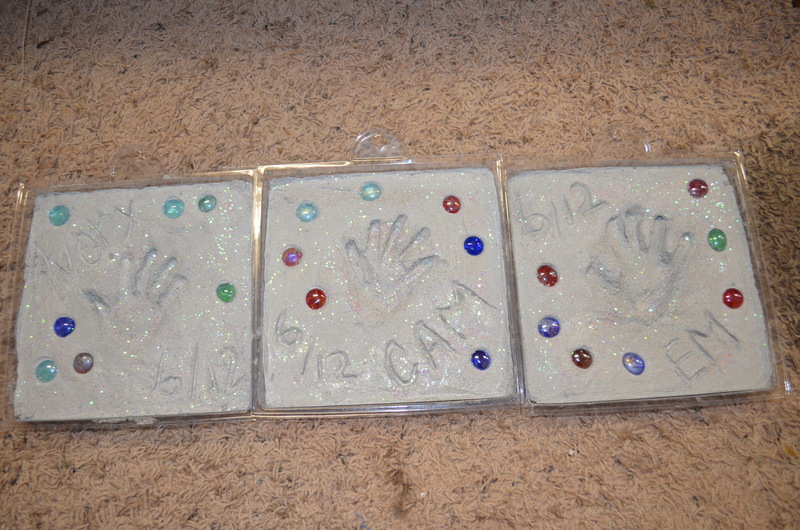 It was interesting trying to get their handprints in there, but I think it turned out pretty cute! We had a great weekend (much better than Mother’s Day, which we all spent sick this year) to celebrate Father’s Day. We had a great lunch with my family at a restaurant, which is always interesting. The girls do pretty good for 16 month olds that just want “down.” We got to go out that night and have a nice dinner thanks to Mimi and Papa watching the girls. And today, Bryan got to play golf with his dad and we spent the evening with his family. Jam packed weekend but we would not have it any other way! We are so lucky to have family in town. Last Father’s Day was probably such a blur. I know my Mother’s Day was.. We were new parents and the girls were only five months old. 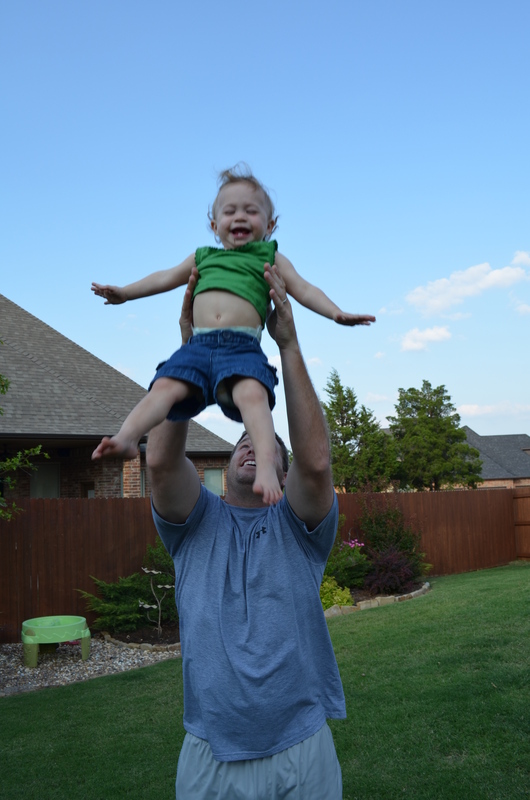 This picture is Bryan’s first Father’s Day last year. Look at those little bald headed cuties! We survived year one and we are sliding into year two a lot nicer than the “babies” stage. We are having so much fun with the girls right now. I know Bryan was so excited to see the girls pick up a little basketball and shoot it into a mini basketball goal. Thanks to his aunt and uncle they can practice more with Coach Dad. 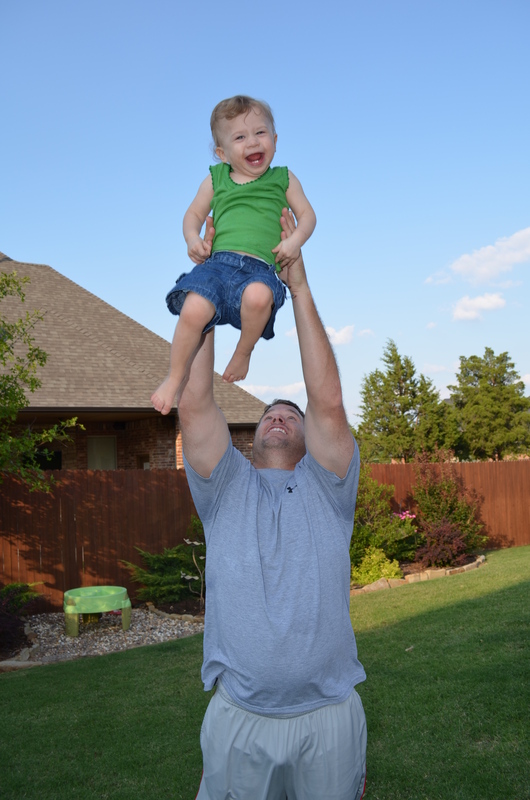 Bryan is such an amazing Dada (as the girls call him). First thing in the morning before he goes to work the girls get to hear his voice in their rooms as he says, “CHEWIESSSSSS.” If you know my husband, he has nicknames for everyone and his girls are not the exception. That is one thing I adore about him is the funny stuff he comes up with. The girls may not like him calling them “chewies” or “Cam Shack” or “Emmie Bear” or any other nickname when they are teenagers, but they think its so funny now. Here is a recent picture of Bryan with the girls. Think they have grown a bit? And..after the girls have had enough of me all day long, they get to hear his happy voice come in the door. 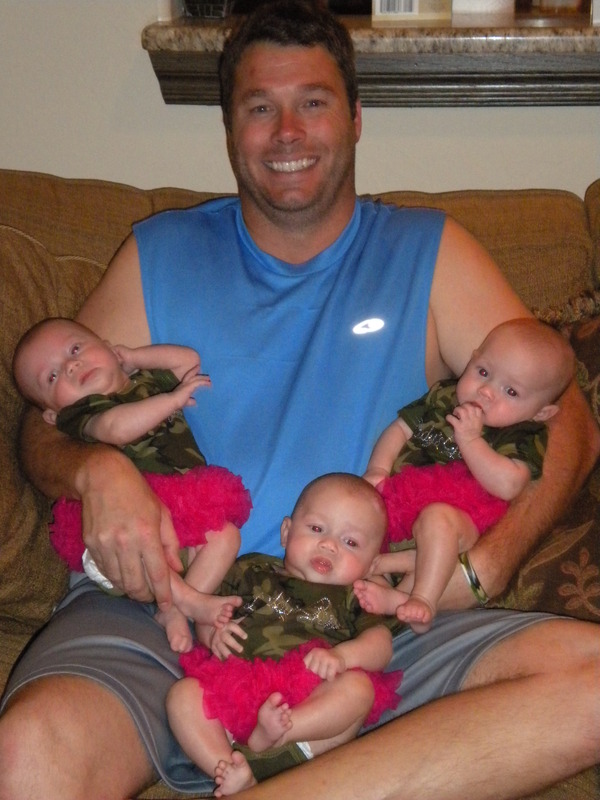 The girls now run to the door with their arms in the air ready to be picked up and hugged by DADA. Bryan and I have sure battled through the first year with tears, fears, joy, happiness, frustration, many many sleepless nights and many moments where we lay in bed after the girls are asleep and we say how lucky we are to have such a beautiful little family. Bryan will send me text messages during the day sometimes that will tell me how he is the luckiest man and how blessed he is to have this family. We are blessed to have such a great man to lead our family. The girls will turn to you as an example of the most important man in their life. They will measure the boys in their life next to you. They will cry to you when one has broken their heart. They will hopefully play a sport you can cheer them on at. They will come to you to be the voice of reason when I am too worrisome..wait..I think you will worry as much as I will :). They will look up to you for so many things and I know you will show them a positive example in their life. And one of those days…You will have the privelage of walking three young women down the aisle. A moment I think every Daddy and Daughter cherish. I know I did. 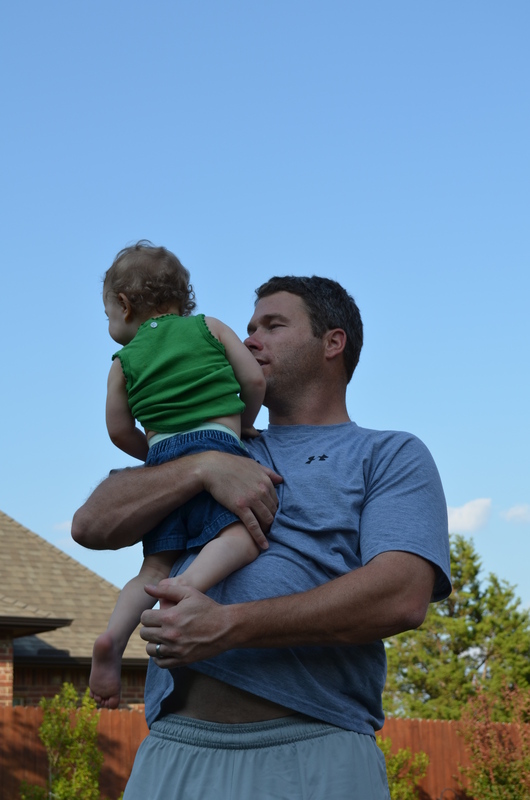 Bryan, thank you for being a great father, husband and provider for our family. We look forward to so many more memories in the future! And a Happy Father’s Day to my Dada : ) It is so much fun to watch my Dad be a Granddad (Papa). He is so wonderful with the girls and it has only made our relationship that much more special to be able to raise them together as a family. And a Happiest Daddy’s Day to the special Papas (My Dad and my FIL) and first time Daddy (My BIL Michael)! It was a big step this past weekend for ole’ Mommy. Bryan and I went away for the weekend and although I was looking forward to it for months it was a different story when the day rolled around. I was looking forward to the little things like dressing up in clothes that were not workout looking clothes. Eating a meal without having to shovel it into my face before someone gets upset or takes someone’s toy. Having an unscheduled day, no routine, not breakfast to make, lunch, dinner, snacks…No diapers to change. Finally, a chance to catch my breath and relax and recharge my batteries. We left the house and I think I stopped crying or tearing up around Norman (we were headed to Dallas). I timed it so we left around their morning nap. I think they knew we were leaving because they fussed and whined and were hard to put down. That made me even more upset. All those things I wished for in one weekend sort of seemed not important at the moment, but I pressed on. It seemed like the longest road trip ever to Dallas, but once we got to the Four Seasons Resort and Spa I was having a great time. The funk was wearing off and I was starting to relax. It felt good to have my hair fixed, makeup on and actually having conversations with Bryan :). We spent the afternoon at the pool. I was actually proud of myself for being in a bikini after having triplets! We had an amazing dinner at a restaurant called Lonesome Dove in the Ft. Worth Stockyards. 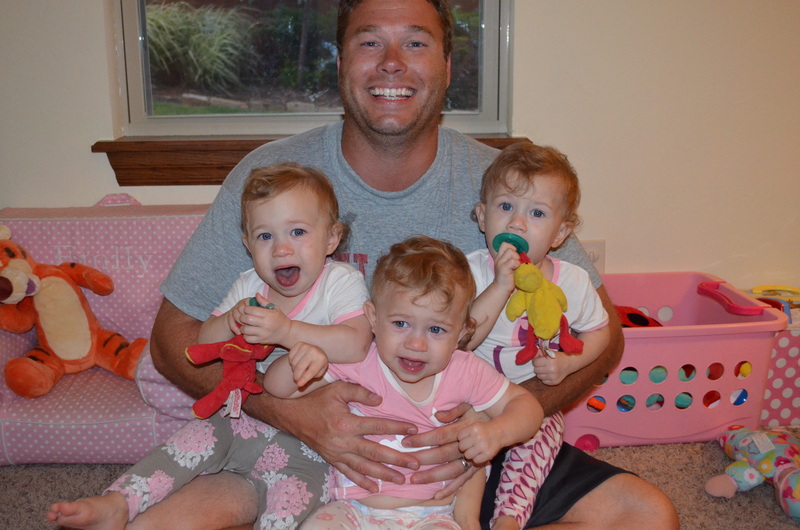 Around 8 p.m., I knew the girls would be getting ready to go down for bed. My anxiety level sort of showed and I was just distracted. They gave my parents a hard time and they didn’t get them down until around 10:30 p.m. I know their sleeping schedule doesn’t seem like something to worry about, but after you have been so scheduled (me being scheduled also) for almost 16 months it is a tough thing to do to just relax at certain times in the day. They are almost never predictable. We have come a long way! The next day I woke up and I knew the day was going to be better than the last. I had lunch with one of my best gal pal’s that lives in Dallas. That was so much fun. Then I spent the afternoon at the spa. That felt amazing. There was a dinner and auction that night in the hotel and we dressed up and had a great time. Still didn’t sleep well. But, that may have had to do with the hotel fire alarm going off at midnight and sending everyone on our floor into a tizzy. False alarm. Then, our weather radio apps kept going off on our phones because of the storms brewing back in Oklahoma. And lastly, someone called our room at 6 a.m. and got the wrong number. We finally got up and made the most of our morning, ordered room service, laid by the pool and got ready to head back. I could not wait to see my girls! We got home and the girls were napping. I wanted to wake them up so bad, but I know better than that! Once they did wake up, they were sort of bashful to Bryan and I. I almost cried because they didn’t really seem excited at all to see us. Like I said, wasted emotion on 15 month olds that have short attention span and a blast with their grandparents! But, it was wonderful to put them to bed and wake up this morning to see their faces!! I think being away always make the heart grow fonder. More importantly, it is a great opportunity to really focus on YOU as a woman but remember that YOU as a woman is YOU as mom and vice versa. They are the best thing I have done in my life, so why would I not feel that way 🙂 I think next time I could handle it better, but right now I don’t want to think about it. Until next month when I escape for a girls’ weekend! Hahaha.